Today has just been whacked out. L got up late so I got up late, which resulted in a complete mash-up of our normal schedule. So I didn't shower or eat anything until now (and it's 2:20 pm), it's snowing and I have to go pick up more freelance stuff, and I know... wah... poor stay-at-home mom. But I'm just totally off today and it feels icky. Showering is one of the central necessities in my life and if I can't shower, watch out because it's serious. It's the one factor that would keep me from going on Survivor. I'd never be able to deal. And we've become obsessed with a new-ish TV show. A kids' show. Yo Gabba Gabba (read more here or here). And if you know me, I'm very anti-kids' shows. Most of them. Anti-Dora, Anti-Diego, Sesame Street is okay because it's a classic, and don't get me started on Barney (which makes me gag as I type it.) But Yo Gabba Gabba is created by musicians/graphic designers/a guy from the Aquabats. Which is cool. And they feature songs like 'don't bite your friends.' Plus, guest stars like Tony Hawk and Biz Markie, The Shins, Devo's Mark Mothersbaugh and Shiny Toy Guns... wow. Now that's a show that's worth exposing my child to. Oh God we love Yo Gabba Gabba. I swear the makers of that are toking up right as they're shooting episodes. Elliott and I have dance parties. 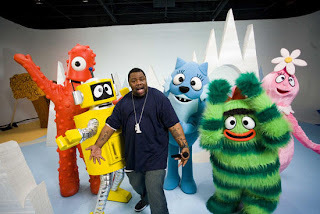 We should have a Yo Gabba Gabba party with the kids. I am totally with you on this. Yo Gabba Gabba is awesome! At first my wife and I were like, 'What the hell is this?!' but it's a really good show with positive messages for kids.